MJC2: Customer Service Award Winners! The MJC² team has won Fonterra's vendor award for Outstanding Commitment to Customer Service for the development and ongoing support of the real-time logistics scheduling system known as Genesis. MJC²'s software plans Fonterra's entire milk collection operation in real-time, dynamically optimising truck movements in response to the highly variable supply volumes and factory demand profiles. Fonterra is the world's largest global milk processor and dairy exporter, delivering high quality dairy ingredients and a portfolio of respected consumer brands to customers and consumers around the world. 22 billion litres of milk are collected every year from 10,500 farms across New Zealand. Up to 15,000 collections are made every day by 500 trucks, delivering to milk processing plants and customers throughout the country. The Fonterra Vendor Awards provide a platform to recognise vendor performance excellence which supports Fonterra's vision of being the natural source of dairy nutrition for everybody, everywhere, everyday. 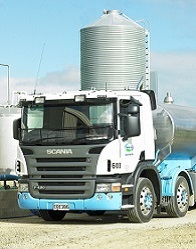 Key to the success of the Genesis project was the excellent working relationship that developed between the Fonterra Milk Collection Team and MJC², combining the in-depth knowledge of the schedulers and dispatchers and the strategic insight and experience of the management team with world-leading software and scheduling expertise. This team has worked together since 2006 to deliver ever-increasing levels of efficiency and service to Fonterra's farmers and customers.